I have never sat in a theatre full of a stranger conglomeration of people before. To my left was a drunk, older couple– who left halfway through the evening because the man couldn’t stay awake. In the row in front of me there was a woman dressed in a long, pale blue dress. The kind you see in shop windows and just know is more expensive than your rent. Her blonde hair curled in elegant ringlets. Next to her an androgynous teen wearing a tshirt that hung off her shoulder as if it too gave off a punk, no care attitude. Rainbow hair in the section below us. A Suit fit for a courtroom in the next. And then me, a loner, secluded on the edge of her row. Close enough to the door that I could escape without a ghost knowing where I went. A congregation of bookworms, geeks in all our glory. Diverse, alone, together. We are brought together by one thing: a love for books. Specifically books written by the man of the evening, Neil Gaiman. I’ve been to author readings before, back in college. Most attendees there strictly for extra credit or mandatory class attendance. An Evening with Neil Gaiman was anything but boring. A lone, English man sat on a stage in front of hundreds and even though he is described as awkward–lovingly by his wife– Mr.Gaiman entertained like a man who was born to it. When he read from Trigger Warnings and Norse Mythology, I closed my eyes and watched as the words he spoke sparked to life behind my eyelids. Gods and Giants and Click Clacks. I walked down the street with the genie and Hazel. I plucked a flower from the base of the mountain in Asgard. I spent my Friday evening with Neil Gaiman, and while there were hundreds of other people sat around me, listening to Mr. Gaiman answer questions about his children, writing, and his glorious friendship with Terry Pratchett, I felt as if it were just he and I in a room catching up like old friends do. If you have a chance to see Neil Gaiman on his tour, go. It was one of the best evenings I’ve had in Dallas so far. Full of laughter, and love for literature. 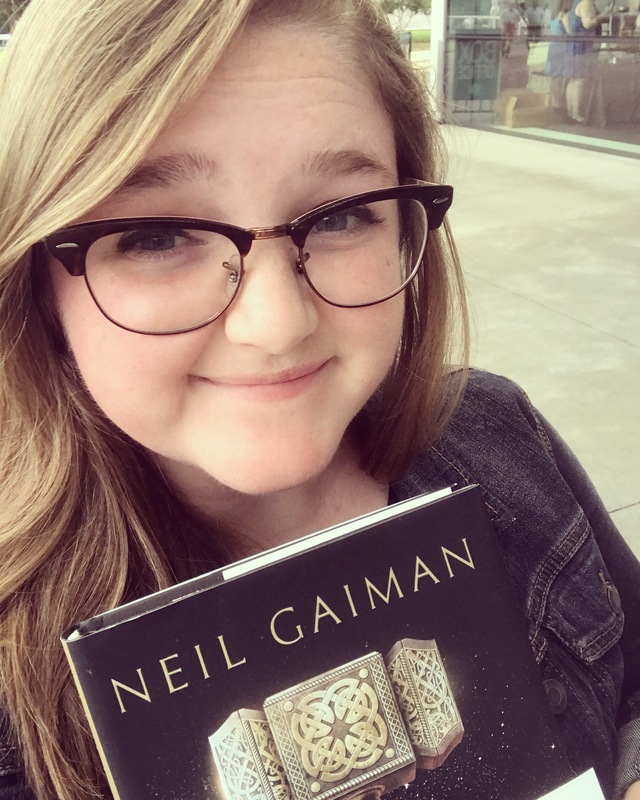 If you liked this post, don’t be afraid to subscribe as I’m sure to write more about Mr. Gaiman in the future (in fact I wrote a review on one of his novels: The Ocean at the End of the Lane). How very fortunate for you to be able to hear Mr. Gaiman in person. It is an experience I am sure you will never forget. Thanks for commenting Darlene. It really was a night I won’t forget! It’s nice to know some of the people I admire in the world seem as genuine in person. I’ve never read Gaiman even though I follow him and Amanda on Twitter. Might have to now! Have read Pratchett though! Really well-written piece. Will be reading more! Thanks to your recommend I’ve just put Norse Mythology on hold at my library 🙂 Looking forward to it.